BRING YOUR OWN LANDSCAPE & TRAVEL PHOTOGRAPHS TO LIFE! Express yourself with watercolours this Spring! 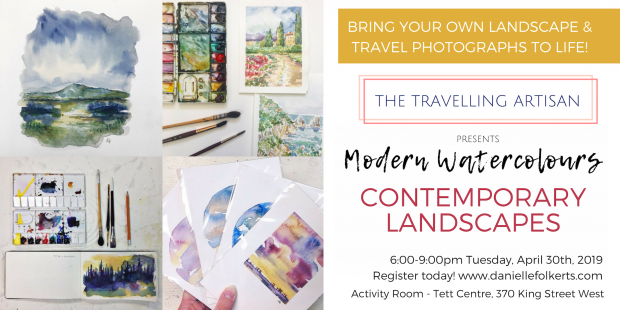 Join painter Danielle Folkerts for her newest painting class - Modern Watercolours: Contemporary Landscapes. This course is your key to moving away from overworked and stiff paintings, to creating your own expressive landscape paintings using fluid colours, expressive brushwork, and incorporating your personal travel photography. This comprehensive painting class will help you practice and understand the process of combining multiple techniques and approaches to produce a successful painting from start to finish. Learn how to work from your own reference material, how to sketch out your composition, and how to use values as your guide to ultimately create a pleasing and meaningful landscape. Become proficient at mixing colours, learn how to embrace mistakes, discover your signature style, and learn to simplify the process. Enjoy live painting demonstrations that focus on how Danielle personally paints expressive skies, foregrounds, fields, mountains, trees and more. Plus, utilize free time to work through your own sketching and painting. Receive one-on-one personal guidance and feedback, and prepare to elevate your creativity this Spring! BONUS: Danielle will also be sharing her personal set up for plein air painting (painting outside, on-site). Learn what you need, and how to start painting and sketching outside! Students are invited to bring 1-2 printed out landscape photos of their own. Landscapes images will also be provided.